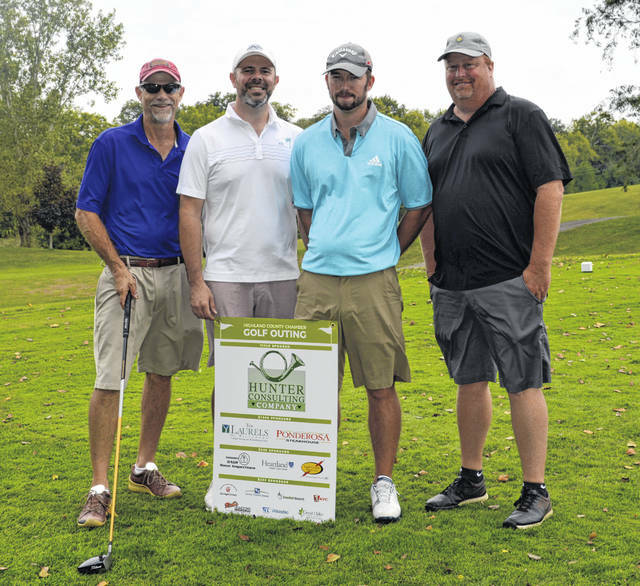 The Highland County Chamber of Commerce held their 28th annual golf outing on Sept. 21st at Buckeye Hills Country Club in Greenfield, Ohio, sponsored by Hunter Consulting Company. This year, the Chamber registered 35 teams and couldn’t have had any better weather for a September golf outing. The afternoon finished with lunch provided by Ponderosa Steakhouse Catering. The winning first place team went to Corner Health Mart Pharmacy of Greenfield, Ohio, second place to Merchants National Bank, and third place to Weller’s Plumbing and Heating. Congratulations to all of our winners, and thank you for playing. We look forward to seeing you next year. Thank you to all of our sponsors and volunteers. Without you, this event would not be possible. Check out our Facebook page, The Highland Chamber, for more pictures. Story submitted by the Highland County Chamber of Commerce.